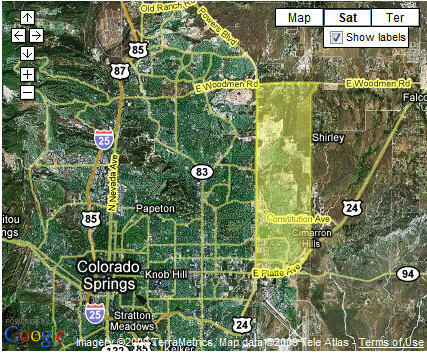 The neighborhoods along the burgeoning Powers corridor are among the most popular places to live in Colorado Springs. Stetson Hills led the way back in the eighties, and since then the area has experienced explosive growth. This also makes it a great place to locate great foreclosure deals! Foreclosed condos and townhomes can go as low as 50k, while foreclosed single-family homes average in the mid 100's and can start as low as 90K. The growth of neighborhoods in this area has been accompanied by the growth of retail areas, restaurants and entertainment, and has become the 'place to be' among Springs residents. There are literally hundreds of small shops here along with large chain stores like Costco, Super Target, Lowe's Home Improvement Center, JC Penney's and Walmart. There is also an IMAX theater and Security Service Field, home to the triple-A Sky Sox professional baseball team and farm team for the Colorado Rockies. For the golfer, Springs Ranch Golf Club is also here as well as the smaller, 9 hole Cherokee Ridge course. Pretty much anywhere you live along the Powers corridor you are close to some kind of park, which is one of the reasons this is a great place to raise a family. City parks are dotted throughout the neighborhoods and the Stetson Hills Open Space is in the northeast corner of the area. Palmer Park, one of the most popular mountain biking locations in the city, is just about a ten minute drive as well. Cimarron Hills is the oldest neighborhood along the Powers corridor and is adjacent to the north gate of Peterson AFB, making it a great place for military families to find the best foreclosure deals. However, all of the neighborhoods along here tend to be decent, middle class neighborhoods with reasonable home prices. Indigo Ranch is one of the newest neighborhoods in the area. The Powers area is served primarily by Falcon School District 49, whose mission is to prepare students, in a safe and caring environment, to be successful, competent and productive citizens in a global society. Some of the schools in the area include the highly rated Stetson Elementary, Sand Creek High School and Vista Ridge High School. Searching for a foreclosure home can be a tedious process. However, the powers corridor offers plenty of options and along with great retail areas, easy commuting and great schools; it is a great place to consider. Click here to search all Powers Corridor homes for sale.